6170 E. CO. RD. 800 S.
Don Dunbar, Ripley County Council President called the meeting to order promptly at 7:00 PM with Council Members Dephane Smith, Juanita Bauer, William Dramann, David Simon, Lawrence Nickell, Edward Armbrecht and was in attendance. Mary Ann McCoy, Auditor Ripley County acted as clerk to the Council taking minutes for the meeting. Neil Comer, Ripley County Attorney was present to advise the council. Council Member Smith made the motion to approve the minutes from February17th, 2004 seconded by Council Members Bauer. Motion approved unanimously. David Bottorff, Association of Indiana Counties, Inc. updated the commissioners on the deduction of Inventory Tax and how it would effect Ripley County . Bottorff also updated the Council on how they could increase the EDIT Tax to help the property owners with homestead exemptions due to Inventory Tax illumination. Bottorff advised that 32 counties have already illuminated the Inventory Tax. Council Member Armbrecht made the motion to adopt the Ordinance To Allow a Deduction for Assessed Value of Inventory for Assessment Year 2005 seconded by Council Member Simon. Motion approved unanimously. Council Member Armbrecht made the motion adopt the Ordinance To Increase the County Economic Development Income Tax from .0025 to not exceed .0013 in order to mitigate the increased ad valorum property taxes on homesteads seconded by Council Member Simon. Motion approved unanimously. Ginger Bradford, Clerk, Circuit Court withdrew her additional appropriation of $9,000 from the Clerk’s Perpetuation Fund. Council Member Smith made the motion to approve the additional appropriation of $15,901.73 Fund #577 Local EMA Planning Grant/Jerry Fry, Director, Civil Defense/Emergency Management seconded by Council Member Nickell. Motion approved unanimously. Council Member Smith made the motion to approve the additional appropriation of $25,000 Fund#586 Domestic Preparedness/Jerry Fry, Director, Civil Defense/Emergency Management seconded by Council Member Dramann. Motion approved unanimously. Council Member Smith made the motion to approve the additional appropriation of $66,383.13 Belterra Riverboat Fund#216 seconded by Council Member Nickell. Motion approved unanimously. Council Member Nickell made the motion to transfer $21,215.88 from Fund#291 (Sheriff’s Improvement) to Fund#293/Sheriff, Bill Davison seconded by Council Member Smith. Motion approved by six (6) members (Dunbar, Nickell, Armbrecht, Simon, Bauer & Smith) and one (1) abstained (Dramann). Bill Davison, Sheriff Ripley County , updated the council members that he would be asking for an additional appropriation (Medical & Housing Acct) in April. Davison also advised the council that they had collected $69,760 Out of County Housing Collections since the first of the year. Auditor McCoy updated the Council Member of a distribution of $45,000 to Ripley County Tourism Bureau due to it being a budgeted item. Ted Spurlock, Rising Sun Foundation presented the Council with the 2003 Annual Report/Rising Sun Regional Foundation, Inc. Spurlock advised the council that the Rising Sun Foundation has taken a proactive stand on Economic Development for Ohio/ Ripley County and the City of Aurora and have a company (Thomas Miller) which will be working with county’s and Spurlock also advised that Rising Sun Foundation has distributed approx. 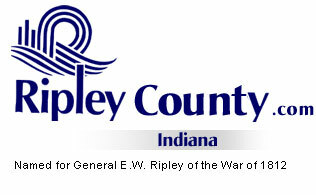 1,000,000 to Ripley County in Grants for 2003. Council Member Bauer made the motion to take off the table motion dealing with the correction of a Deputy position (5th/3rd) seconded by Council Member Nickell. Motion approved unanimously. Council Member Bauer made the motion to correct the Superior Court Deputy’s from 5th to 3rd Deputy seconded by Council Member Simon. Motion approved unanimously. Scott Melling, EMS Director updated the council members on the progress of the EMS . Council Member Dramann questioned if the EMS was going into Franklin County . Melling advised that there had been a problem with getting into the Franklin County area due to the city of Batesville/Pocket Road but that he thought that had been corrected. Armbrecht expressed concern that the money paying for the EMS is money from the citizens of Ripley County and if we are going into Franklin County they should be paying Ripley County for the service. Commissioner Little advised that they are working with Franklin County to see what they would pay for the service. Council Members Smith, Nickell, Dramann & Armbrecht signed the 2004 Meeting Schedule. Council requested that the Auditor send letters to Grand Victoria/Rising Sun/Ohio County and Belterra/Switzerland County updating them on how the money received had been used to better Ripley County . Economic Development/Chuck Folz advised that Ted Spurlock had already given a summary report on grants. Folz also advised that they are working on a sewer project in Sunman, In. and that the Economic Development Board voted to give up to/not to exceed $125,000 at a low interest rate. Technology Committee/Edward Armbrecht advised that a company presented to the committee a Data Basics/Filing program on CD-ROM and that they are just looking. Southeastern Indiana Regional Planning Committee/Dephane Smith/No Report. Solid Waste District Committee/Donald Dunbar/Meeting Canceled. EMS Advisory Committee/Dephane Smith advised that Melling had answered the EMS questions at the meeting she had attended and that they had a lot of positive feed back. Council Member Smith made the motion to adjourn until the next regular meeting on the 20th of April, 2004 @ 7:00 PM in the Ripley County Annex seconded by Council Member Simon. Motion approved unanimously.